We are one of the trusted suppliers of positive displacement rotary pumps or Cavity Pumps which are made from superior quality cast iron or comes with stainless steel parts. It is also available in 10 standard elastomer materials. 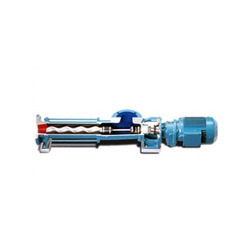 For superior pumping mechanism, a precision designed stator and rotor is provided in these cavity pumps. The actual pumping elements of the pump are rotor and stator. The single helical rotor rolls eccentrically in a double threaded helix stator of twice the pitch length. The fluid travels axially with relatively low velocity and minimal agitation. The stator is made of a resilient elastomeric material and bonded to the stator tube. The important feature of the pumping principle is the ability to handle slurries and solid particles. The elastomer stator also permits passage of solid particles due to elastomeric deformation. The compression fit of the rotor and stator enables the Tushaco progressing cavity pumps to handle gaseous and low viscosity liquids. The pressure capabilities of the pump are a function of the number of cavities. Tushaco progressing cavity pumps are available in a wide variety of materials - cast iron or stainless steel wetted parts and 10 standard elastomer materials. Tushaco versatile progressing cavity pumps are rugged, compact and highly efficient. Fluids, which are delicate, shear sensitive or abrasive, low or high viscosity, with fibers, with high air content or large solids, can be conveniently handled by Tushaco progressing cavity pumps. Water treatment plants, Oil & Gas, Chemical, Food Process & Production, Petrochemical Process, Sewage Treatment Plants. Relief valves, base frame, coupling, coupling guard, companion flanges, pressure gauges, electric motor, variable speed drives, stator protection devices (against dry running) etc. Sturdy drive design provides strength for rigorous continuous operation. Unique pivot-joint design extends service life and reduces replacement cost. Close coupled models with built-on speed reducers offer compactmpumping unit.